We decided that for Adam's high school graduation rather than giving him a watch or some other object that he would likely break or lose we would take him on an outrageous adventure that he would remember for a long time. After some consideration one of the items on Dad's life list of things to do and places to go just happened to percolate up to the top of the list ;-). 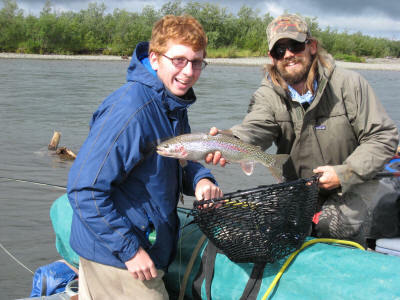 After extensive reading of hundreds of web sites for outfitters for all kinds of trips in many different regions of the state at all different levels of luxury (or lack thereof) a float trip on the Kanektok River in southwest Alaska was chosen. 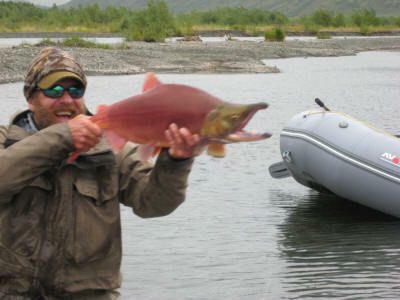 This option combined a somewhat more reasonable price, the opportunity to get far into the wilderness, and a lack of loud, stinky outboard motors and dependence on daily fly-outs for fishing. 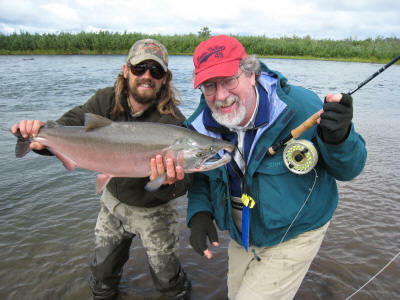 Timing was chosen to come after the severe bug season and in time for the silver (coho) salmon run (with the opportunity to catch four different species of salmon), August 1-7. There was still plenty of daylight--sunrise was about 5:30 am, sunset after 11 pm, not quite the midnight sun of a month earlier, but pretty close. We flew from Boston to Anchorage, via Seattle, did some sightseeing (more on that below), and then flew the ~300 miles from Anchorage to Dillingham, home of the largest salmon fishing fleet in the world. This fleet, comprised of boats no longer than 32 feet (chopped off in some "interesting" ways to comply with this law) is used only two weeks a year and spends the rest of the time in drydock! 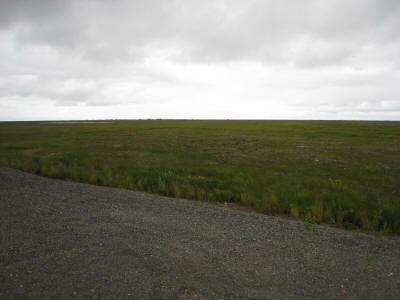 There are no roads to Dillingham, everything there comes in by air or by sea. After a surprisingly delightful B&B stay, we boarded the Otter, a float plane for the trip to Kagati/Pegati Lakes, the headwaters of the Kanektok. The float, shown in blue on the map, was about 95 miles. 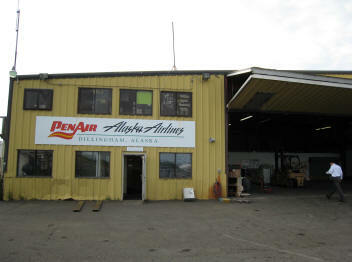 At the end of the trip we flew from the native village at Quinhagak to Bethel on a wheeled charter plane, and from there to Anchorage, Seattle, and Boston in a marathon journey. 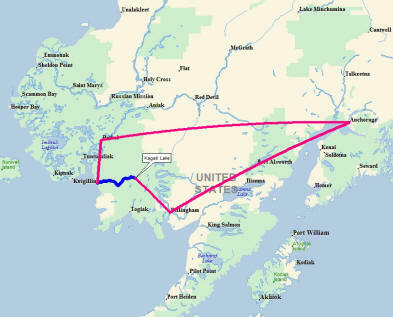 Our trip for the first five days was within the Togiak and Yukon Delta National Wildlife Refuges. 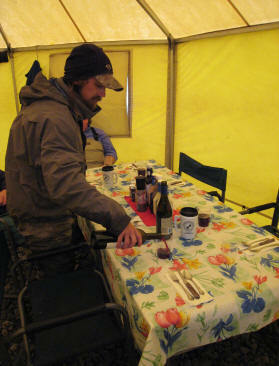 Only five outfitters are licensed to operate in the Refuge and two of them were teamed together for our trip. We didn't see anyone else for the first four days. No permanent campsites were employed, we camped on the gravel bars and attempted to leave no trace of our passing, setting up camp each evening and tearing it down in the morning. 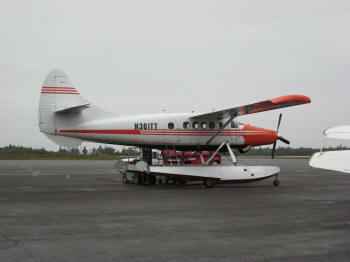 Because of the vagaries of Alaskan weather and mountain air travel no river travel was planned for the first day. 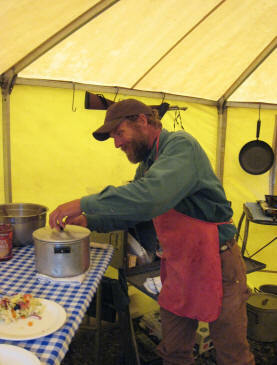 Just as well perhaps as the winds howled and the rain came down from arrival around noon until the next morning. A fairly large tent housed the kitchen and dining hall, we slept (on cots, thankfully--the floor was constantly wet) in the green tents shown above. A smaller tent housed the latrine and shower (!) facility. The rafts were 18 foot Avon's with rowing frames and substantial cargo capacity (nice boats!). Normally these trips have six guests and three guides, but the week we went there were only three guests, so the guides had a bit easier time of it and we got some extra attention. 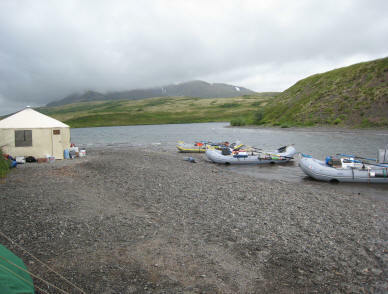 The dining hall provided respite from the rain and wind, not to mention the site of some pretty amazing gravel bar cooking. Breakfasts ranged from bacon and eggs to French toast to one of the better eggs benedict I've ever had. Dinners included fabulous steaks an done night the largest pork chops any of us had ever seen (they were delicious). The wine selections were very good though Budweiser was the high end of the beer selection. Lunches were the same every day, sandwiches, chips and cookies on the gravel bar-- we usually had to be dragged to lunch because it intruded on fishing time. Temperatures were fairly constant, in the high 40's at night, getting up to 60 or so during the day. It might have gone higher during our 15 minute burst of sunshine. The rain was pretty constant, two days of fairly heavy, constant rain, the rest of the time it was probably actively raining 25% of the time with passing showers. We were thankful that the wind died out after the first day. 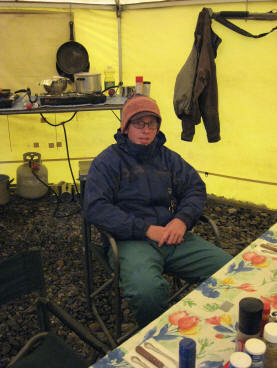 Staying warm and dry on this trip requires the best equipment and some due diligence-- once something got wet it stayed that way. Doing it again I'd like a sleeping tent in somewhat better, more water-tight condition, but otherwise our gear performed well for us and we stayed happy despite less-than-ideal weather. Fishing began after packing up camp for the morning, either casting from the rafts or wading from the shore at places that deserved more than a single cast while floating by. 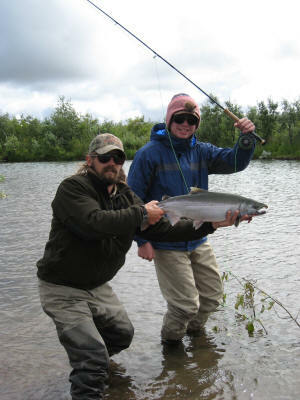 All the fishing was catch-and-release using only a single barbless hook, and returning the fish to the water as quickly as possible. 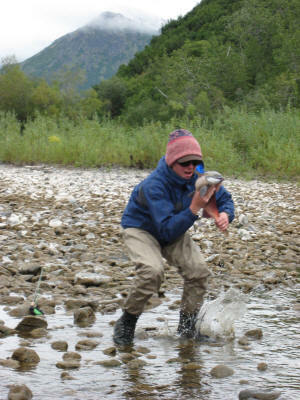 Early in the trip the target species were rainbow trout (year-round residents of the river) and Dolly Varden (basically a sea-run Brook trout). 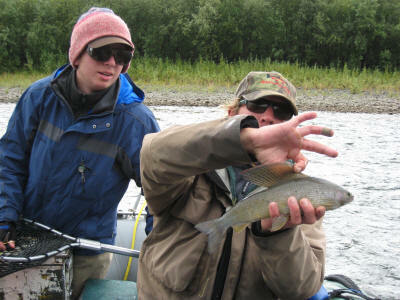 We also caught grayling and one Arctic Char. 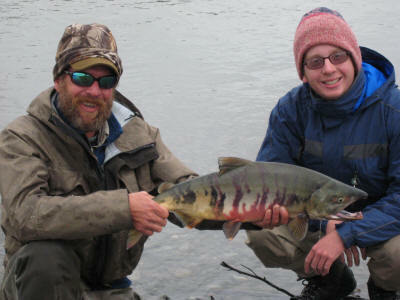 The trout basically sit downstream of the spawning king and chum salmon and eat any of the eggs that escape the nests. 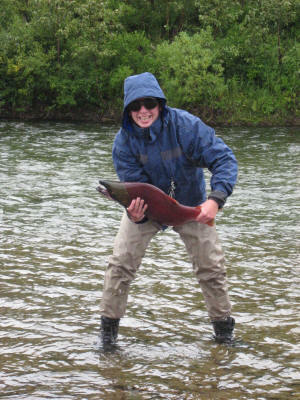 Farther downstream the rainbow intensity increased and the primary food source switched from eggs to the flesh of dying salmon. The last day and a half as we approached the ocean we ran into the first wave of incoming silver salmon. These fish were fresh from the ocean and very feisty-- unlike the other species who have stopped eating by the time they reach fresh water the Silvers will aggressively attack a lure. At a typical 8-10 pounds they can provide quite a contest. Salmon spawning in the river when we arrived included the large Kings (Chinook), red (sockeye), and chum (dog) salmon (not clear why they all have two names). For the most part the spawning salmon were quiescent and/or dying, having accomplished their goal, but we did manage to hook up with feisty examples of each. 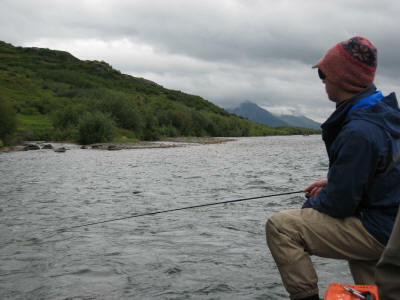 We didn't really keep count of fish, though our guides were required to for the state. The second day we (Adam and me) caught 57 Dollies between us and were astonished--the next day we caught 76! 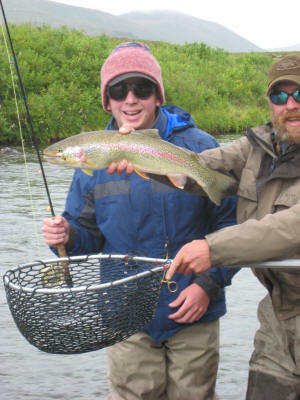 The rainbows were the most fun, and the species we targeted most specifically, on the peak days we probably caught 25-30 rainbows, all in the 20-24" category. It's probably worth mentioning that the very first Dolly I caught was the largest trout I'd ever caught in my life, and he was a very average fish! We had a lot of help in putting this trip together. Ultimate success was the responsibility of our primary guides, Theo and Haydon Copeland from Appalachian Angler of Boone, NC along with their able assistant David (who's last name I've unfortunately either forgotten or never learned). 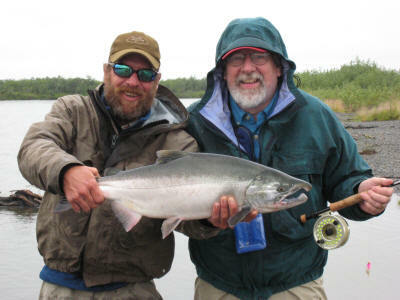 They operate in Alaska as Beyond Boundaries Expeditions. 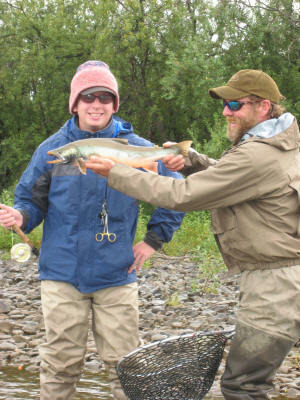 Theo, Haydon and David were as good fishing guides as we've ever had, expert rivermen, and great company. Theo seems to have an endless supply of funny stories suitable to any occasion. For us Yankees it was a real immersion course into the South! 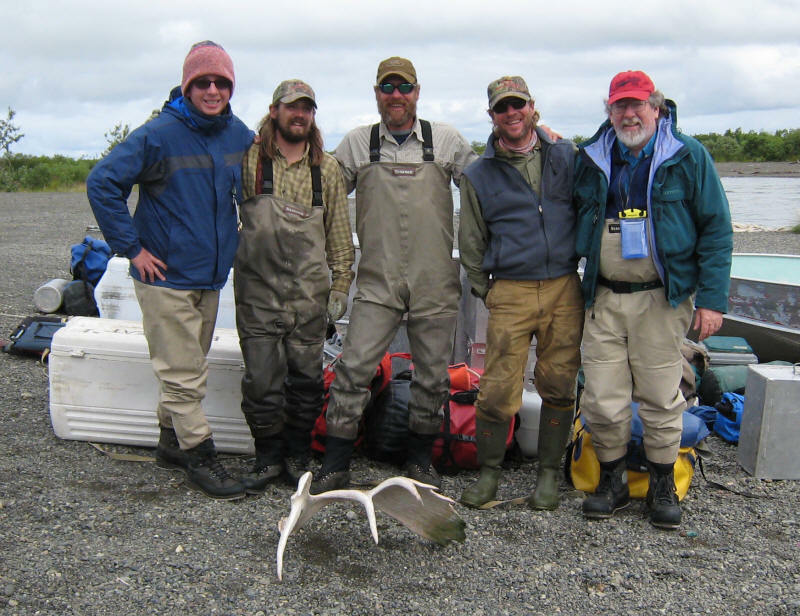 I can't recommend these guys highly enough -- they were cheerful in adversity, always helpful, unfailingly polite, and really, really know how to catch fish and help their clients catch fish! Ryan Peterson at The Fly Shop in Redding, CA patiently answered many questions and gave us good advice in the process of booking this trip. Our flies were tied by Phil Fischer of Phil's Custom Trout Flies, who did a fantastic job for us. 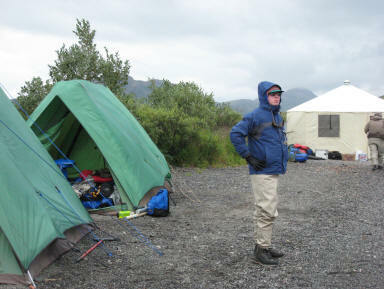 Phil also provided invaluable advice on dealing with weather and knowing what to expect during our trip. Three flies did the yeoman work for us, the Babine Special and Eggo for the Dollies and upstream rainbows, and a fly I don't know the name of, but which came to be referred to as "Barbie" which worked unbelievably well on the Silvers. We also made good use of an "egg-sucking flesh" (don't ask) pattern on the downstream rainbows (four in four casts at one memorable bank). The most fun single fish turned out to be a rainbow caught on a mouse pattern thrown (with some trepidation) into a pile of logs. The big 'bow came out from his hole and sipped this big mouse up just as nice as you please--just like he's supposed to. My grin was unstoppable. 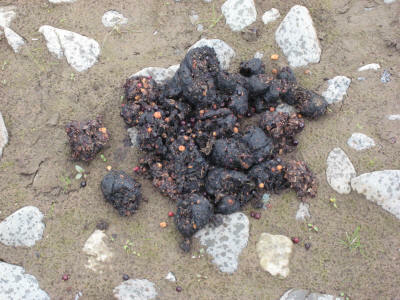 Fortunately, friend Grizz seemed mainly interested in eating berries (blueberries and salmon berries) at this point of the summer, and didn't feel the need to contest with us for fish. 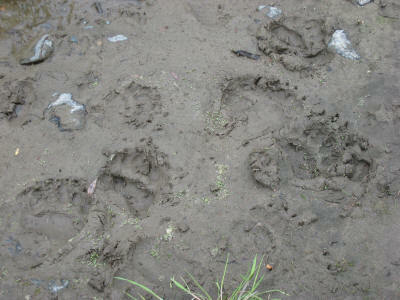 We saw about six bears while coming down the river. No telling how many saw us! 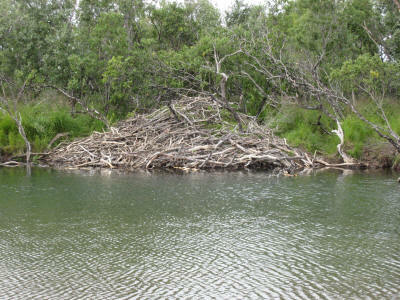 Beavers were much in evidence. I didn't get pictures of some of the most impressive structures because it was raining to hard to risk bringing the camera out . While the wind blew there were no insects to be found, though as soon as it stopped the no-see-um's could quickly become overwhelming.  We only had bad mosquitoes at a couple of spots, again highly breeze dependent. There was limited amount of insect life in the river-- we saw a few mayflies at a couple of different spots, hardly enough to qualify as a hatch. The river freezes solid in the winter and the resident fish (rainbows and grayling) migrate up to the lake or to a couple of very deep pools to over-winter. The villages are on the tundra, where it is very, very flat. 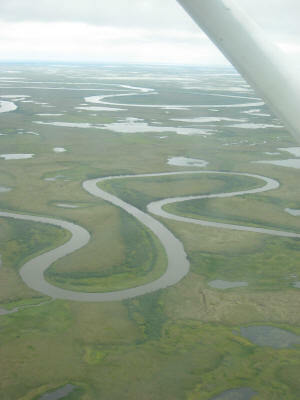 (and almost more water than land, as seen in the departing aerial photo below. 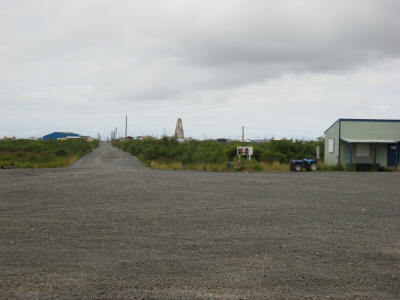 The picture on the right is the village of Quinhagak as seen from the airstrip. Not a tree or bump for miles. Where the river has cut into the banks it was possible to see the permafrost-- the ground thaws only a foot or two deep during the summer months, below there is mud-ice.